Pot Roast is another one of my favorite comfort food meals. Just the smell of it!!! how is lingers through the house while it cooks, it really is simply the best. We stumbled upon a great sale on Chuck Roasts, so we bought four of them. How can you resist at $5-$6 each ($1.99 price per pound) what a steal of a deal. 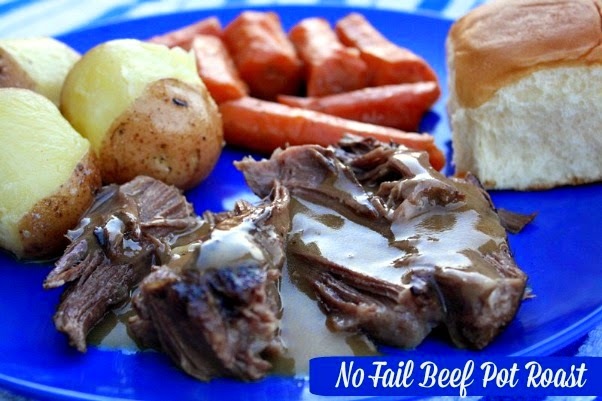 I make so many meals with a chuck roast, Shredded Beef Taco’s, No Peek Beef Tip’s, and this No Fail Pot Roast recipe. This is kind of my fix it and forget it meal. Just toss all the ingredients in the crock pot and forget it. Well except for the veggies I add those the last hour of the cooking process so i don't have mushy veggies. What I love most about this recipe is that by the time it is all finished and done with it makes it's own gravy. The meat is top notch tender and just falls apart. This is a perfect Sunday meal or if you have guests coming in town. I like to serve mine with white rice my daughters favorite and hot yeast rolls. I always try to make a special dessert for after the meal it just wouldn't be complete without dessert everyone knows that. If you don't have time to make a dessert fresh fruit or a fruit salad would be just as nice. The complete recipe is at the end of the post. I don't use any particular brand as you can tell by the picture i use generic onion soup mix and mushroom soup. Rinse the roast with water and pat dry with paper towels. Add 2 tablespoons olive or vegetable oil to a large skillet. Bring the heat up and really get that pan hot. Add the roast and let it sear for about 5- 7 minutes per side. Add the seared roast to the crock pot. Sprinkle dry onion soup mix over the roast and add cream of mushroom soup. Cover and set slow cooker on low and cook for 6 - 7 hours. Turn pot roast over about half way through cooking time. During the last hour of cooking prepare the carrots and potatoes. Peel carrots and potatoes and cut into pieces. I like to par-boil my veggies for about 8 - 10 minutes in a pot of water before adding to my crock pot. This way the veggies cook all the way through and they are not mushy when the roast is done. Drain the water off the potatoes and carrots and add to the crock pot the last hour of cooking. Season with a bit of pepper and cover and cook the last hour. The meat just falls apart and this recipes makes it own gravy. This is so wonderful the next day for roast beef sandwiches, or in flour tortillas or just warmed up and served with some rice. Cooks Note: If you do not want to par boil the potatoes and carrots before adding. Then just add them the last 3-4 hours of cooking. This looks absolutely delicious, this is what my childhood was all about. Thanks for all the pics and all your hard work on your blog. 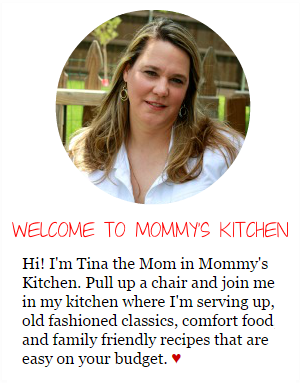 I have cooked so many recipes in the past week from yours and the Southern Plate blog that my family keeps saying "Whats next?" Hi Joan I am so glad you keep coming back. Yeah!!!! 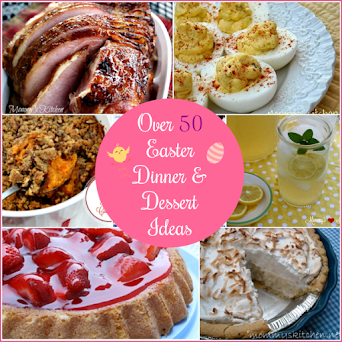 I just love posting all these recipes I am so happy people are starting to come around and prepare some of the recipes. I am glad you family is loving the food. I to grew up on food and meals like this one so this is everyday cooking for me. Hey, this looks yummy, especially now that it is cooling off in Ohio. If you need a quicker one....put meat, 1 can onion soup, 1 can beef stock soup, one can of sherry or red wine. Cook low for 6-8 hours. Add salt and pepper totaste at the end, served on mashed potatoes! Live.Love.Eat...... I cant stop I am addicted just like everyone else. HiHoohio That does sound good. Thanks for the suggestion i will give that one a try, it will be a nice change. Hi Ben thanks for stopping by Mommys kitchen. The house smells amazing when i make this dish. You have to give it a try. I do this too, but I also add a can of Tomato soup. 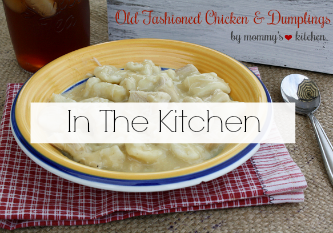 Yes, it may sound weird, but it makes a really great gravy! Tina, I agree. Pot roast is a major comfort food for me. I also get a couple of roasts when they're on sale and freeze them. Hey great Texas minds think alike. Great post neighbor. that looks like a great fall/winter meal, yummy. Tina, I try this recipe and blogged about it today. Thanks again for another great recipe. Hello, I really love cooking in the crockpot but when I cook roast it is hit or miss if the meat tastes good. 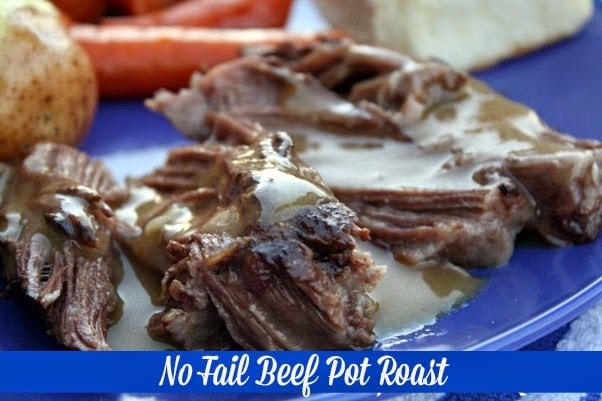 Can you suggest what type of roast is good for making pot roast in the crockpot? Also I've used the recipe before and LOVED IT but my husband and kids did not like the mushroom flavor so I made them brown gravy separate. Do you have any suggestions on how to make the brown gravy in the crockpot with the roast? Thankyou so much! I have a big oval crock pot from Rival. When I cook my roast, I put in a half cup of water, but don't put in any seasonings. It still cooks it great. I add potatoes, squash, carrots at the end of the cooking cycle. You might think this is a terrible way for the drippings because a lot of people use it for gravy which is nice but I love my doggy too and give her a nice taste treat at times. After the roast is out and I have just drippings in the removable stoneware, I add one cup of water, and three cups of Gravy Train and leave it on the WARM setting for a little bit. I then seperate what is in the crock pot into three portions. Instant treat for my dog! I am 44 yrs old and I am aweful cook! I was never shown how to, and trying to go by recipes seems to never turn out the way it says. 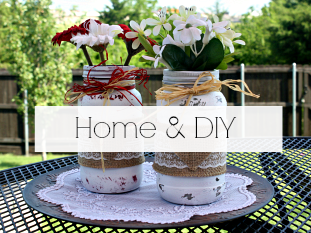 I am SO glad that someone showed me your site, because like a child, I NEED PICTURES! And you have pictures! Because of you showing step by step, I can actually do something right! I love it! This is my new favorite sight! Can't say thank you enough! I also homeschool my children and it's good to see your kids in there helping. It encourages my kids (12 yr old twins boys) to get in there, and help too. Signed a happy mom in NC. Hi. I tried your potroast today and my family and I loved it!! I've used the onion soup mix off and on but I've not put it with the mushroom soup. I've also not parboiled my veggies-I usually just toss them in. I can't believe what a difference the addition of the soup and just parboiling the veggies made! It was sooooo good! Thank you! 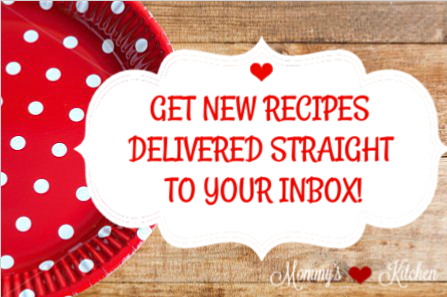 I can't wait to try more of your recipes! I tried this recipe earlier this week and it turned out great. At first I was a little skeptical, thinking that having both the Onion Soup Mix and Mushroom Soup would make it too salty, but I am glad to say that I was wrong. I will definitely use this recipe again and recommend it to others. Thanks! Question... On your pork roast recipe, you add veggies right away and beef roast you wait till last couple of hours. Reason? 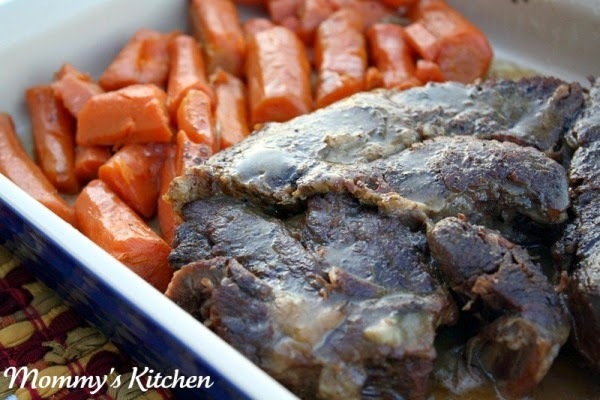 Here's an easy suggestion for Work Day Pot Roast! Add 6 cups water to crock pot, turn on high, stir in 3 packets of Pioneer Brown Gravy mix (each makes 2 cups). Wisk thoroughly. You can also add a packet of Lipton's Onion Soup Mix at this time if you like! Add rump or chuck roast of your choice, 2-3 pounds. Add potatoes that are peeled and halved, carrots and sliced onion. Stir to mix again and put lid on and turn down to low. Off to work and when you return in 8-9 hours, your house will smell amazing and your dinner is all ready! Once everyone eats, I like to take the leftovers and cut them in bite size pieces, add back to gravy and have a wonderful beef stew for either tomorrow's dinner or for lunches. Enjoy! Made this tonight and it was wonderful. Thanks! No Water Roger. Just empty the can of soup over the dry soup mix and the roast. This recipe is def. a keeper!! Myself and the kids love the way this comes out. They normally are not too big on meat but go back for more whenever I use this recipe. 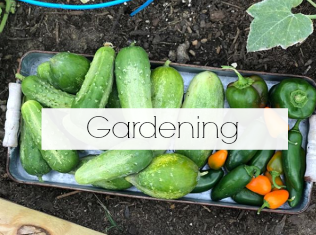 Bookmarked to find more delicious ideas. Thank you. Can you do foil packets on top of the roast with one packet of carrots and one packet of potatoes? I was looking for something I could put in the crockpot while I was working and my hubby can serve immediately when he got home with the kids. Sounds yummy, so I'd like to try it. Approximately how long would this take if made in a cast iron Dutch oven on the stove top? Thanks for Mommy's Kitchen! 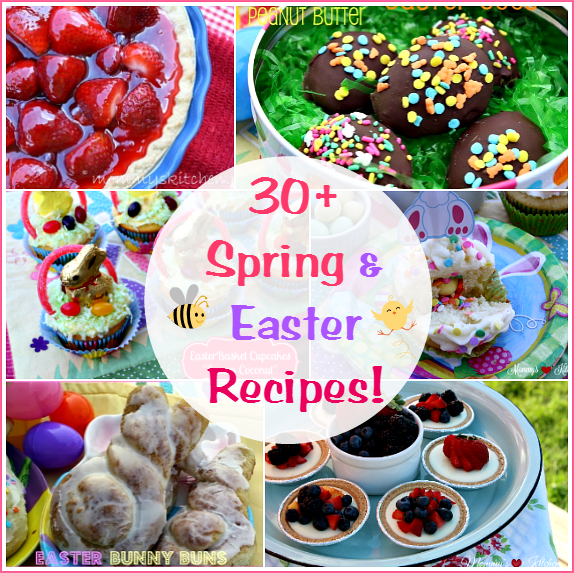 Your recipes always sound so wonderful and inviting and the pictures help so much. Since having a heart attack, my husband has to carefully watch salt intake. Is there a substitute (or recipe)for canned soups and things like Lipton Onion soup? I don't always think of using a crock pot, but in the oven is great.. The difference in these recipes & what I use is I make a Rouex for my gravy.. Learned it in New Orleans & every body loves it..especially my kids..After I made the gravy, I put the roast in a roasting pan, pour gravy over it & cook in oven or crock pot till tender..i also do this for a stew, except I cut roast in smaller pieces, brown, then make gravy when meat is tender, add carrots, diced potatoes, onions, whatever else you like in a stew, cook till tender.. So good on a cold day!! I make this A LOT! When she says "no fail" it really is no fail. I add a bit more veggies then the recipe calls for and i also add a coarsly chopped onion and celery. (We are veggie freaks) it gives my man and I a nice meal, and him 2 or 3 lunches for his 12 hr work shift. I am doing KETO and this recipe is decent (minus potatoes) which can be picked through. I found this page by chance years ago AND I LOVE!!!! THIS SOUTHERN LADY. Her step by step instructions, photos if the ingredients and taking pictures as she goes. Love love love and admire this wonderful lady!